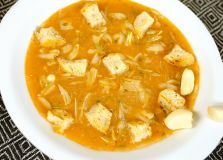 This recipe for garlic soup is a healthy Mediterranean recipe. It melds the richness of a healthy olive oil with garlic with a bit of spice. It may not sound like a combination we are used to, but believe me it makes a fantastic soup. Not only is it tasty is it very a healthy soup recipe. We all know that healthy fats are very good for us and that olive oil has many health giving properties. Garlic health benefits are enormous and well documented. It has antibiotic, anti-inflammatory and anti-viral properties. All help to prevent disease. Heat the olive oil in a large heavy stockpot or soup pot. Add the garlic and sauté until golden brown. Stir in the paprika and cayenne pepper. Add the bread cubes and sauté until they are firm and golden. Carefully add the boiling water to the pot, making sure the fried bread cubes are not broken. Add the salt and pepper. Cover the pot and simmer for 1 hour. Slowly drizzle the beaten eggs into the pot, stirring constantly. Simmer just a few minutes until the eggs are cooked. This garlic soup is just one of our healthy soup recipes. Browse them here. The only change I would make to create an even healthier version of this soup is to use whole wheat bread instead of white bread. A whole wheat Italian bread would be perfect for this recipe. I would use a good quality Italian bread for this recipe. Soft whole wheat bread from a plastic bag probably won't work quite as well. Some of you may have omitted bread from your diet. If so, this isn't the recipe for you because the bread is an integral part of this recipe and adds to the texture and bulk of the soup. For that reason it can't be omitted in any way that I can see. But for most of us, moving away from a heavy meat based meal to a meal of this soup with a light meal or a salad is a huge improvement in meeting our nutritional needs. Plus there are only 6 slices of bread in this recipe for 8 servings. That isn't a lot of bread per serving of soup. The lighter nature of a meal like this really meets the requirements of eating healthy to be compatible with a higher vibration. As with all recipes, select the ones that suit you and your dietary preferences. This recipe, made with a good quality olive oil and lots of fresh, healthy garlic, is a winner for me.